To sustain the seas, advocates of marine protected areas and those in fisheries management must work together, not at cross purposes, urges Ray Hilborn. On 1 September, government leaders, directors of non-governmental organizations (NGOs) and others will meet in Hawaii at the International Union for Conservation of Nature's World Conservation Congress to discuss environmental and development challenges. Twenty-three NGOs, including the Pew Charitable Trusts and the Natural Resources Defense Council, are calling on the IUCN to make 30% of the world's coastal and marine areas fully protected from fishing and other forms of exploitation by 2030. Most ecologists and conservationists now accept — in theory — that even if as much as 20% of a region were cordoned off from fishing, most of that area's biodiversity would exist outside the protected zones as long as effective fisheries management was in place. Yet the dominance of MPAs in conservation policy has, if anything, increased since the 2000s. MPAs also dominate the scientific literature on marine conservation. Researchers documenting the effects of MPAs on biodiversity, in my view, ignore or underappreciate the benefits of fisheries management. Jane Lubchenco and Kirsten Grorud-Colvert4 for instance, have equated biodiversity protection in the oceans to the establishment of no-take areas, writing: “Even lumping all categories together, only 3.5% of the ocean is protected” and “only 1.6% is 'strongly' or 'fully' protected.” And in 2014, Carissa Klein and co-authors5 evaluated the degree to which the ranges of more than 17,000 species are contained within MPAs. I interpret this as implying that species whose ranges do not fall within MPAs will be lost, although these authors concede that, for some species, “the best conservation outcome may be achieved with other strategies, including fisheries regulations”. Because of fisheries management, overfishing has largely been eliminated in US waters7. 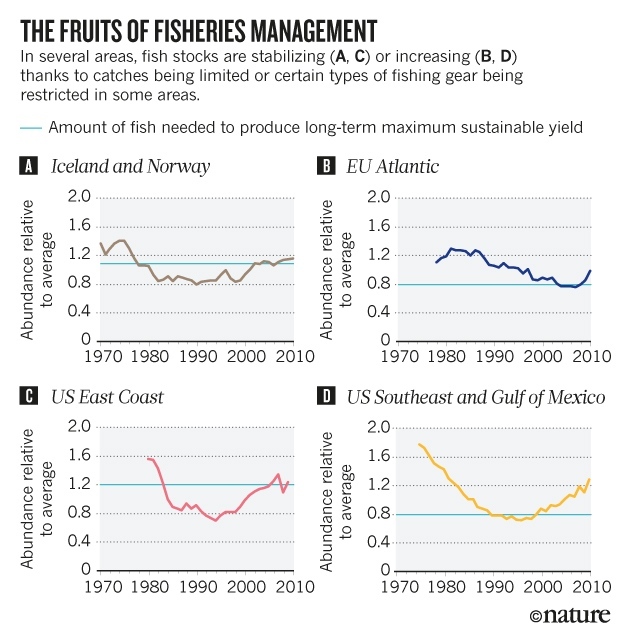 The proportion of fish stocks listed as 'overfished' — those in which abundance is lower than that needed to produce near-maximum yield — halved between 1997 and 2014 to 16% (see go.nature.com/2946lg4). Overfishing has also largely stopped in the European Union's Atlantic fisheries, New Zealand, Australia, Iceland, Norway and Canada (see 'The fruits of fisheries management')8. And management strategies recently implemented by major Latin American countries, including Peru, Argentina and Chile, have reduced the proportion of stocks that are fished above optimal rates from 75% in 2000 to 45% in 2011 (unpublished data). In short, it is now clear that for those countries with effective fisheries management in place — a group of nations responsible for 45% of the global catch — fish stocks are stable, or increasing. Of course, most of the world's fisheries, especially in Africa and in parts of Asia, have no protection of any kind. Marine spatial planning is a generic term for the process of resolving conflicts in the use of marine resources and would seem to be the obvious mechanism to integrate fisheries management and MPAs. Yet after more than a decade of discussion and some attempts at implementation, there are few examples of the process effectively bringing the two 'tribes' together to work towards common goals. I suspect that this is, in part, because insufficient efforts have been made to convince both parties that decision-making bodies represent their interests appropriately.